The middle class is getting squeezed more and more each day. The system that worked for our parents, working hard at one job and saving for retirement, is broken. Effectively, 50% of your salary goes to some form of tax. Without proper tax and financial guidance it will get taxed even more as it’s passed down to your children. Simply, you can’t fix your cash flow problem until you figure out where that money is going. We’re going to break down common myths and misconceptions about income, savings, and taxes. For example: a lot of people think that mutual funds are a great investment, but the one who’s really making money are the people who own the funds. We’ll show you the right way to invest, in funds with low fees that actually perform. We’re also going to show you all the different taxes you pay – even the ones you might not realize are leaving your wallet. We believe that financial education is the first step to financial freedom. 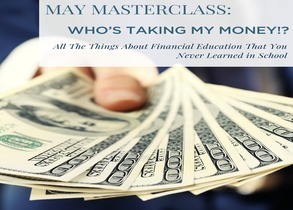 You’ll leave this masterclass with a renewed sense of financial literacy. You’ll understand all the different taxes you’re paying, and how to strategically plan to help offset those costs.